In what will probably be the wrap-up on the current them of special snowflakes, let’s focus in on the corollary of today’s twisted the-universe-revolves-around-me solipsism which is: how dare you judge, criticize, or even look askance at me! Or anything, for that matter, as the aggrieved-by-proxy are quick to jump upon any slight against another in the name of…justice? fairness? self-actualization? The mind is well boggled by these statements. 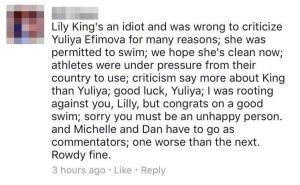 Efimova broke the rules. She was caught. She was punished for cheating. This directly and negatively impacts others like King. It robs them of their effort. Everyone knows this. Everyone also knows without a strong stand the cheaters will continue cheating. Yet everyone is supposed to remain meekly silent lest they stir up a controversy. But why, exactly, is it a controversy to point out an obvious wrong? In the world of radical egalitarianism run amok, discrimination is inherently evil. Yet discrimination, in and of itself, is a tool we do and should use all the time as thinking, rational, sentient beings governed by more than just animal instinct or our most base desires. The ability to discern between good and bad actions, right and wrong behavior, is critical to our health and well-being both individually and as a society. If you still have a few shreds of sanity in an insane world and are wondering how we came here, there’s a good chance you helped things along by agreeing with or acquiescing to things which were just “no big deal.” Teaching our children to just walk away from bullies, punishing them with zero tolerance rules on fighting, traded faux peace and tranquility for lessons on right and wrong. In the name of equality you destroyed the very concept and eradicated the sexual distinction, and now wonder why we’re fighting over bathrooms and people get to pick their own race or even age. If you’re wondering how we came to a point where Western leaders seem unable or unwilling to halt the influx of people with a professed hatred for us and our way of life, yet ever uttered the idiotic cliche “one man’s terrorist is another man’s freedom fighter” then you were there at the beginning. If you’ve ever read a dystopian novel and wondered how people could allow things to get so bad, it was from this very failure to stand up en masse and identify truth as truth and lies as lies. If you want to halt the downward dissent into madness, then discern and then proclaim right and wrong to be just so.